Classic white and elegant pale blue hues combine in a symphony of Jazz music motifs decorating this ketubah. Sweeping notes and clean lines blend together tastefully to convey visual richness without the cacophony of color. 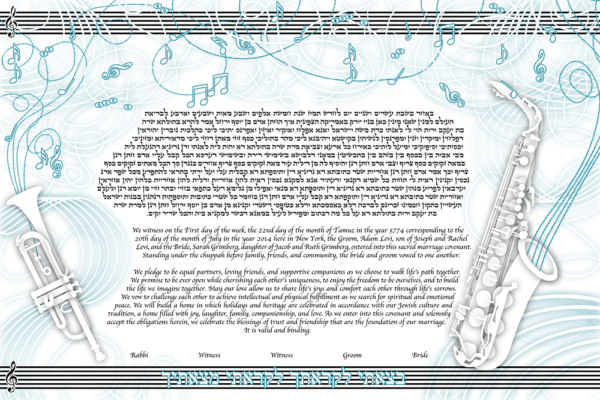 This ketubah is perfect for the couple that shares a love of smooth sounds and timeless appeal. Paper Tunes is a fun, romantic way to express your love of music–and each other. Play on. All Ketubah Artists are members of the Artist Direct program! What does this mean? This means that each artist personally designs, numbers, and sends the Ketubah to you him/herself!